There’s a new Cecil in town. 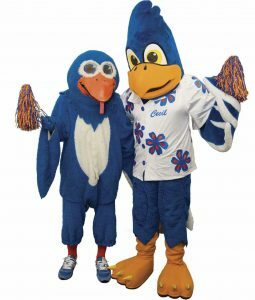 Since he’s at least the third in a direct line of Sagehen costume evolution, let’s call him Cecil 3.0. Senior Associate Dean of Campus Life Frank Bedoya, in whose closet Cecil 2.0 resided for many years, still has the head of what may have been the original Cecil—call him Cecil 1.0. We were unable to determine when or by whom that Cecil was designed and built, but Bedoya says by the 1990s it was falling apart. “Bill Almquist ’98 was instrumental in coming up with the new design, which we had made,” he says. Over the years, Bedoya not only housed Cecil 2.0—quite often he was Cecil. He also worked with generations of Pomona students who also donned the costume to bring Cecil to life for some campus event. Which brings us to 2017. Since the company that created Cecil 2.0 was no longer in business, there was no question of refurbishing the old costume, so the Pomona-Pitzer Athletic Program and Pomona’s Stewardship Office took the lead to create a new Cecil—or should I say Cecils? Due to growing demand, the order was placed not for one costume, but for two. Cecil 3.0 and his twin (whom we might call Cecil 3.1)—designed and built by ProMo Costumes of Marion, Ohio, based on design concepts provided by the College—are taller, more athletic and a bit more modern-looking than their predecessor. They’re also a bit better dressed—able to choose between a basketball jersey, a football jersey and a snazzy button-up with blue and orange flowers. They also come with a ventilating fan inside the head and an ice-vest to keep the wearer cool under all that heavy velour and padding, even while dancing inside a hot gymnasium. And for now, at least, inside the head, there’s that luxurious new-mascot smell.